Billionaire Tom Steyer plans to shower $30 mln on Democratic candidates this year. That might help the party take control of the House in the U.S. midterm elections. But the hedge funder’s parallel campaign to impeach President Trump could complicate their task if they win power. Tom Steyer, a hedge fund manager and a prominent Democratic fundraiser who has mounted a high-profile advertising campaign advocating the impeachment of U.S. President Donald Trump, holds a news conference to announce plans for his political future, in Washington, U.S., January 8, 2018. 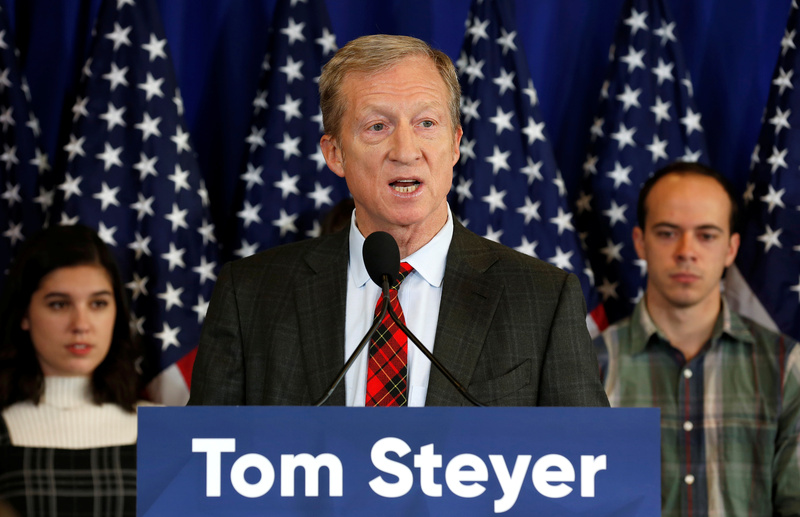 Tom Steyer, founder of the asset-management firm Farallon Capital and a prominent Democratic donor, announced on Jan. 8 that he would not seek office in 2018. Instead, Steyer will spend $30 million to help the Democratic Party take control of the House of Representatives. The billionaire had been the subject of speculation that he might attempt a run for governor of California or one of the state’s seats in the U.S. Senate this year. Steyer’s funding will focus on trying to boost young voter turnout in 10 states. He said he will not require recipient candidates to pass a “litmus test” of supporting efforts to impeach President Donald Trump. Steyer has spent $20 million on a campaign to remove the president from office.